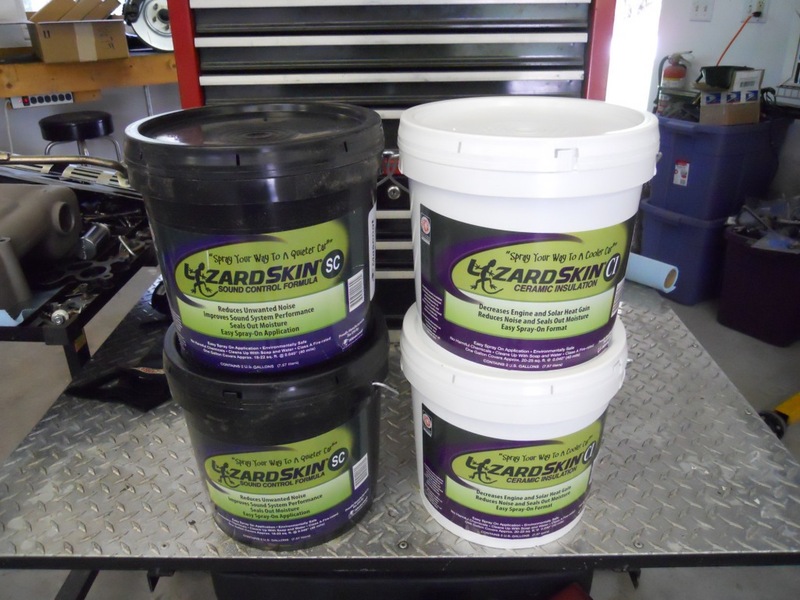 I saw a demonstration of LizardSkin at the PRI show a few years ago. 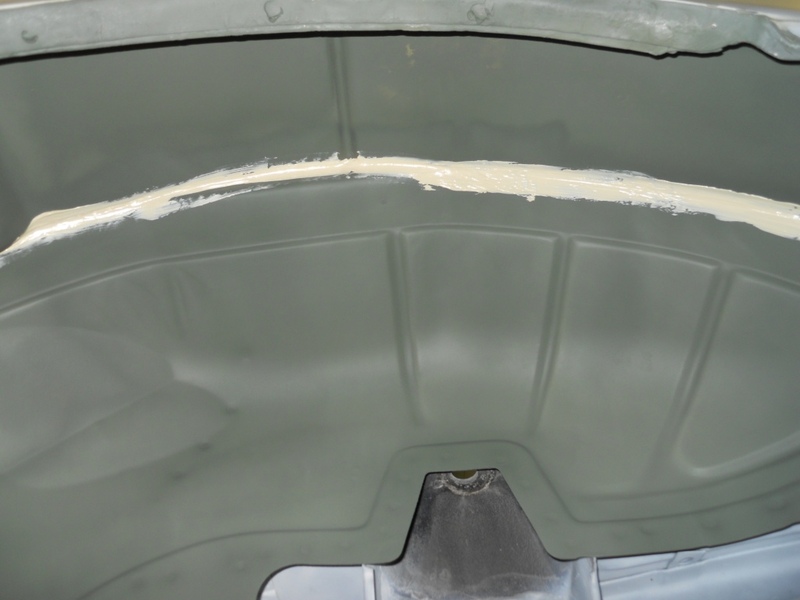 They took a electric skillet and coated half of it with their Ceramic Insulation (CI) and the other half they left bare. 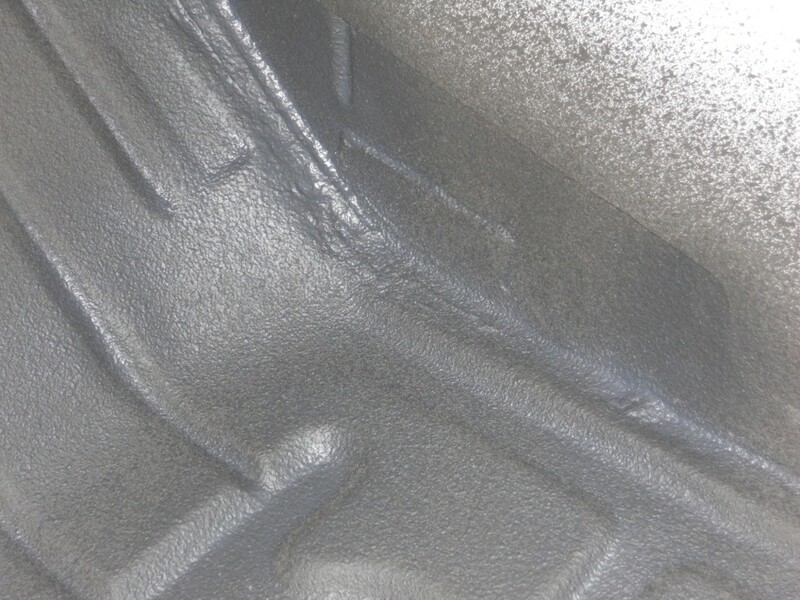 The skillet was turned on and an ice cube was placed on each half. 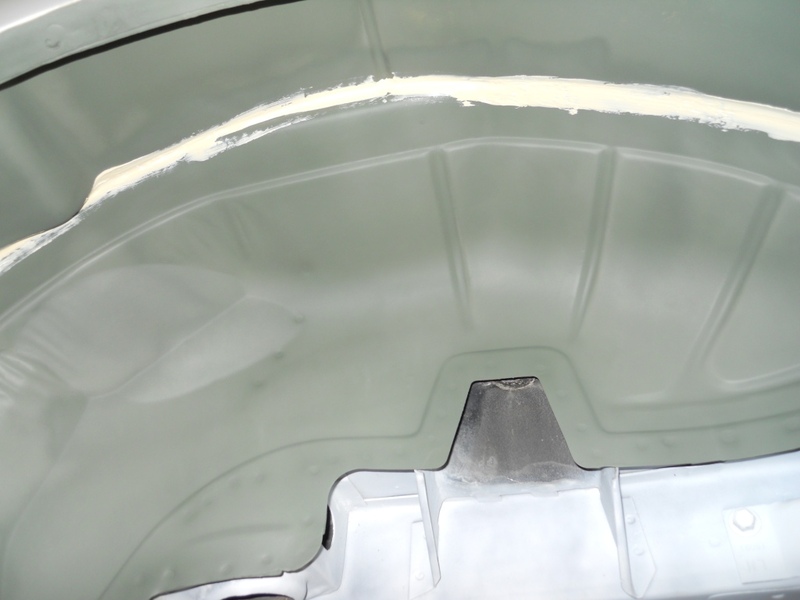 The ice cube on the coated side slowly formed a puddle of water and took several minutes to melt, never fully evaporating. 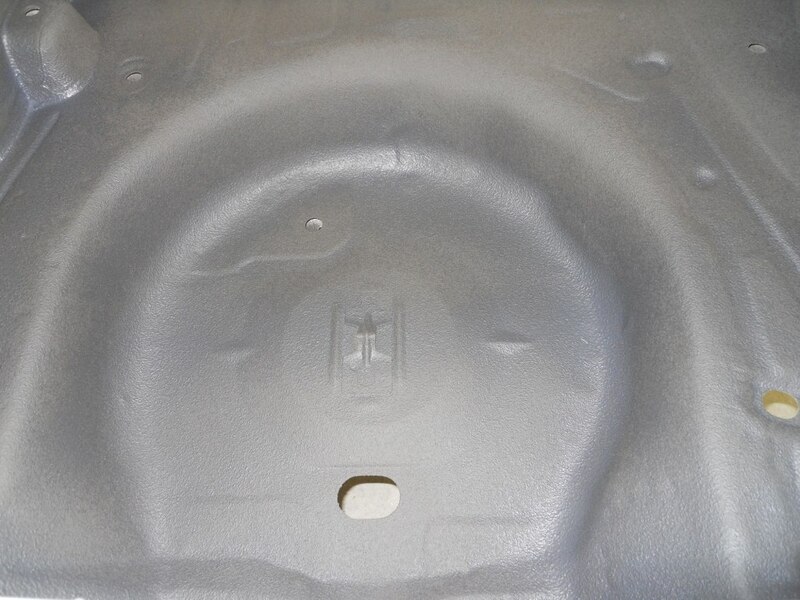 The ice cube on the uncoated side turned to water and boiled away in a matter of seconds! 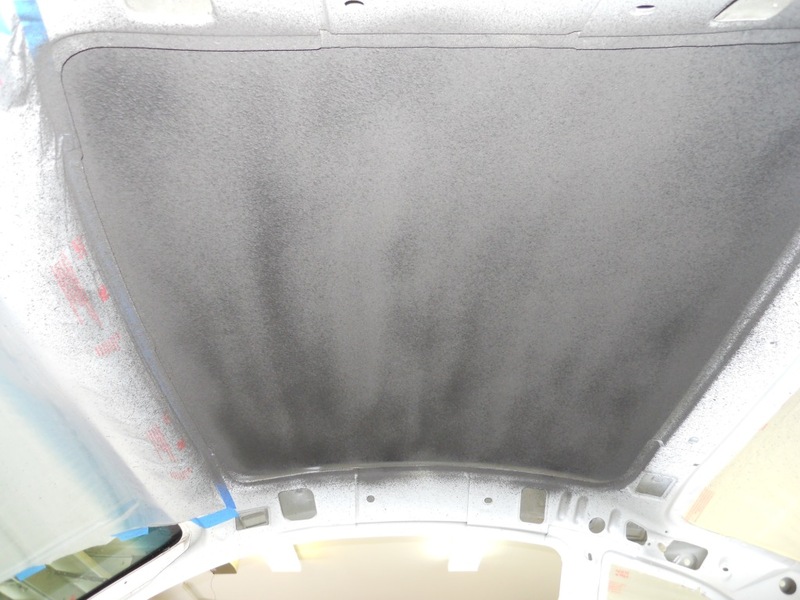 Their product line now includes a Ceramic Insulation (CI) and a Sound Control (SC) product. 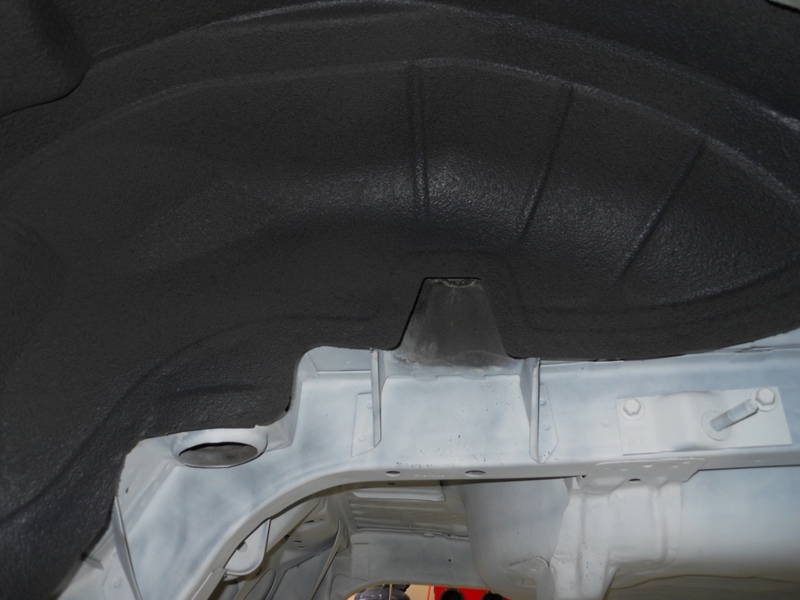 Manufactured by Mascoat, the world leader in insulating coatings, LizardSkin CI and SC coatings are two environmentally-friendly coatings that are applied seamlessly and rapidly, while providing superior thermal insulation and protection against vibration and noise. 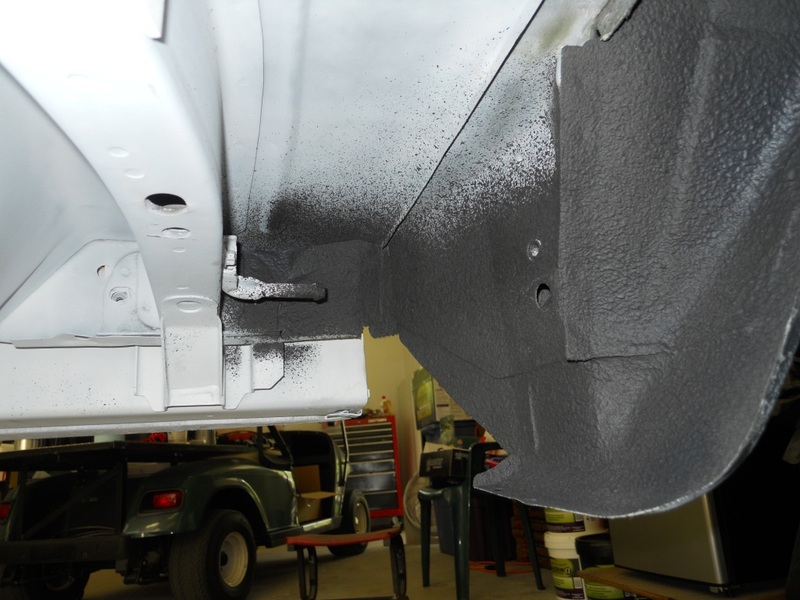 Both products are easily spray applied, using shop air, resulting in fewer parts and less waste. 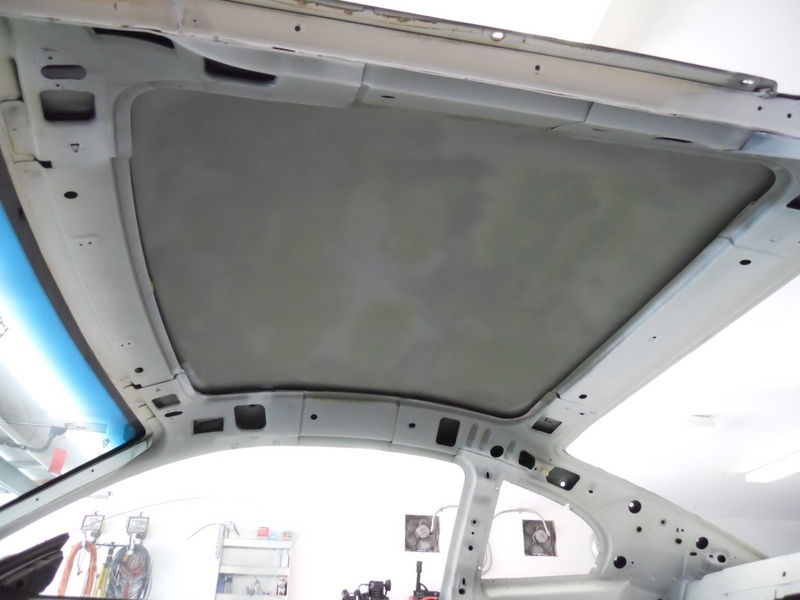 They may reduce engine and solar heat transfer by 30°F or more and sound transfer by 12 decibels or more. 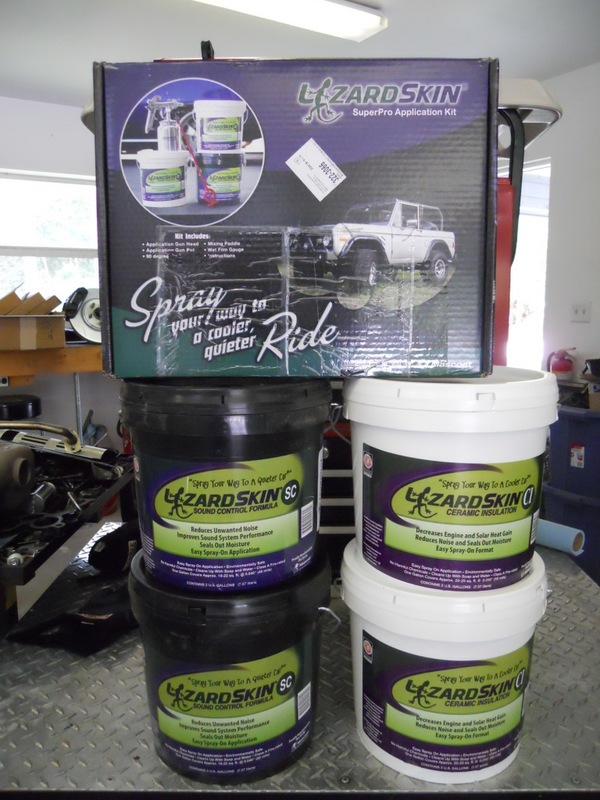 With LizardSkin, the substrate is always protected from moisture and corrosion, while giving you a cooler and quieter ride. 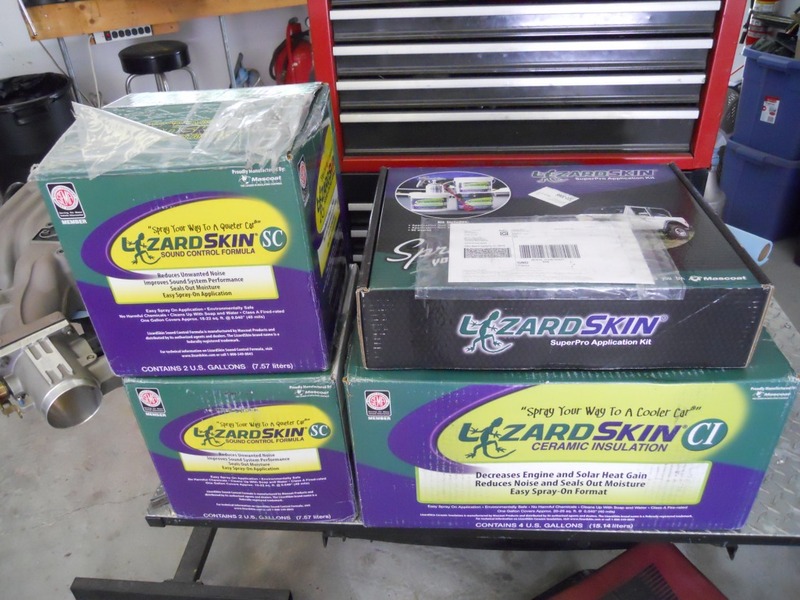 Before I could apply the LizardSkin, some preparation was in order. 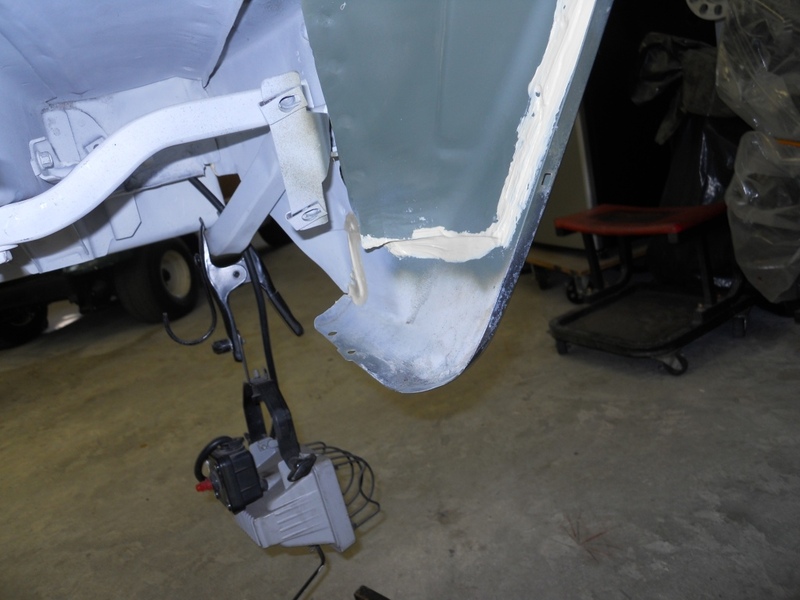 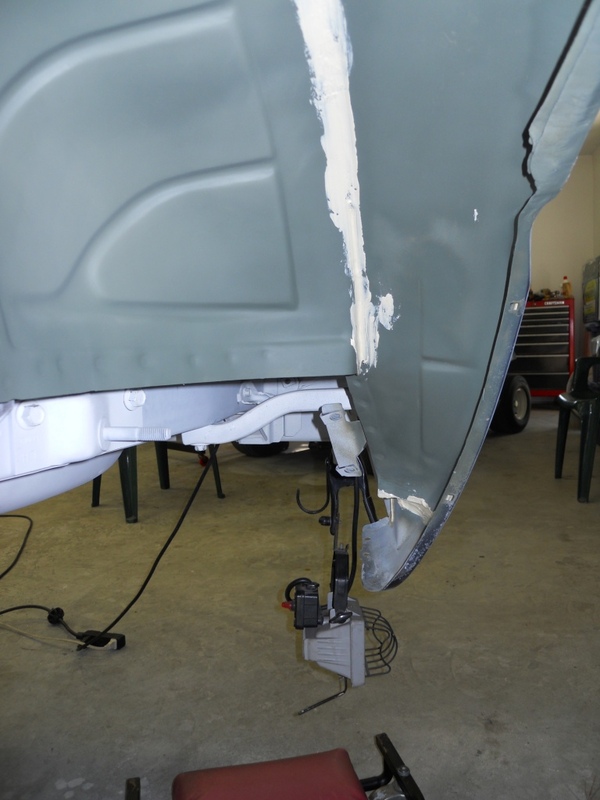 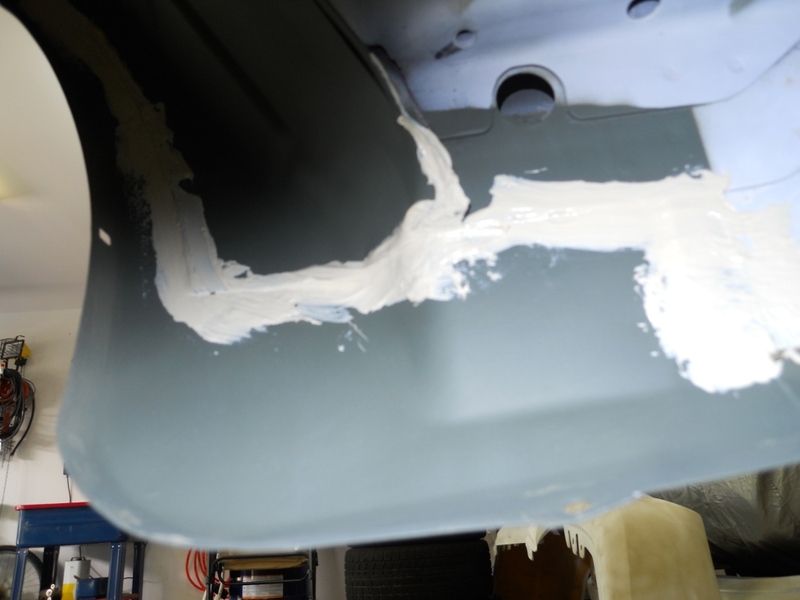 I had removed almost all of the factory Ford seam sealer along with the sealer applied during the earlier repairs, so I needed to apply new sealer to the seams. 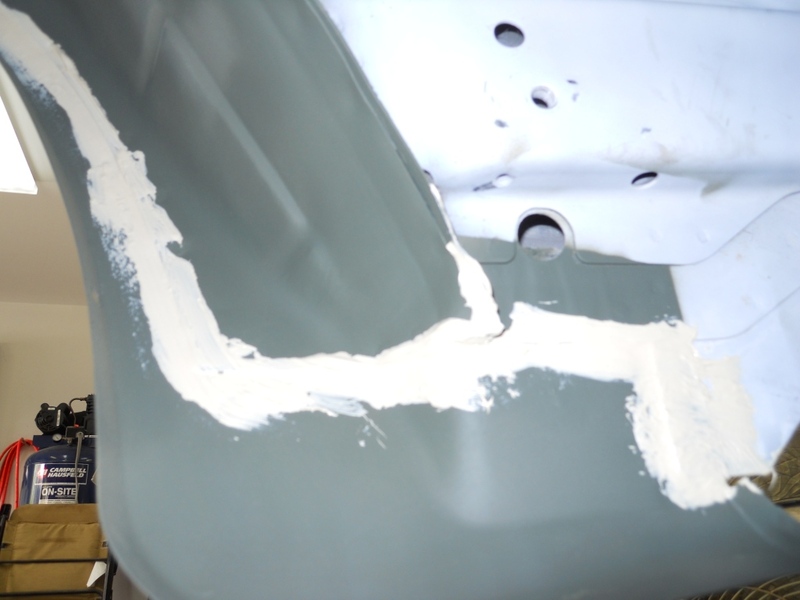 A paintable seam sealers is required. 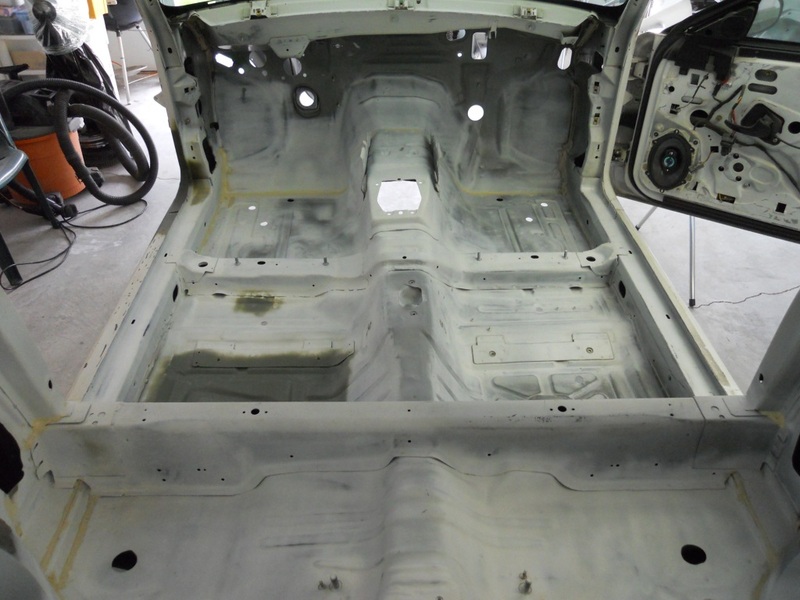 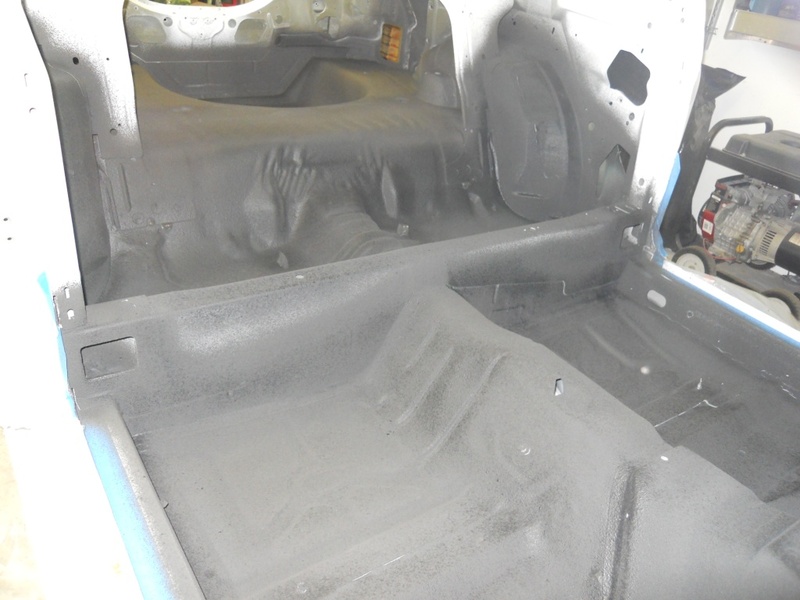 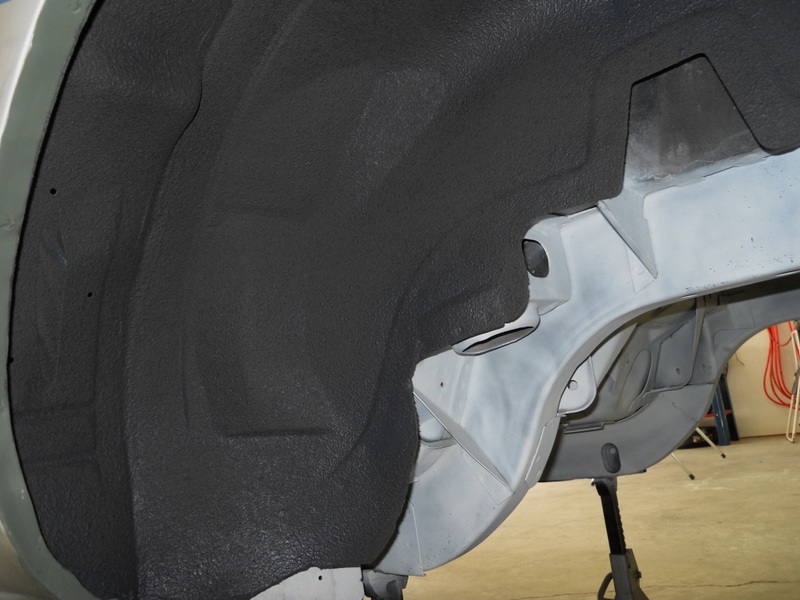 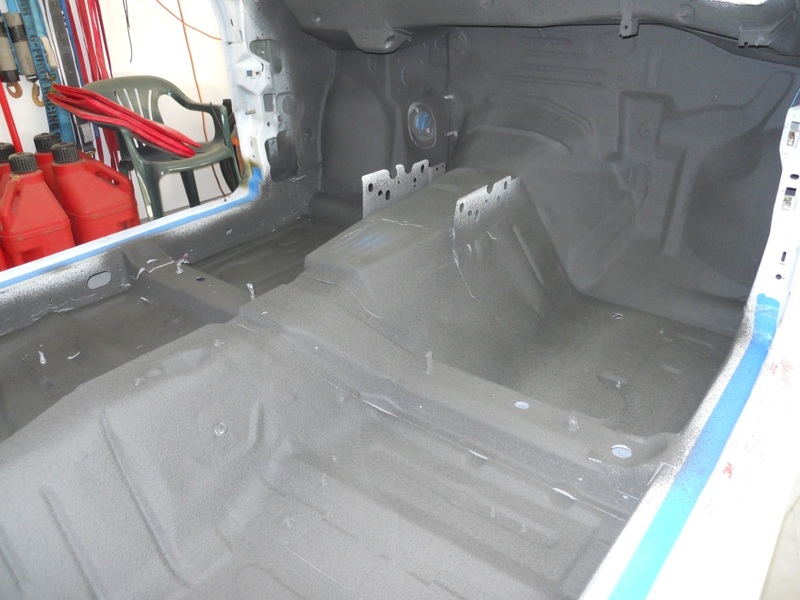 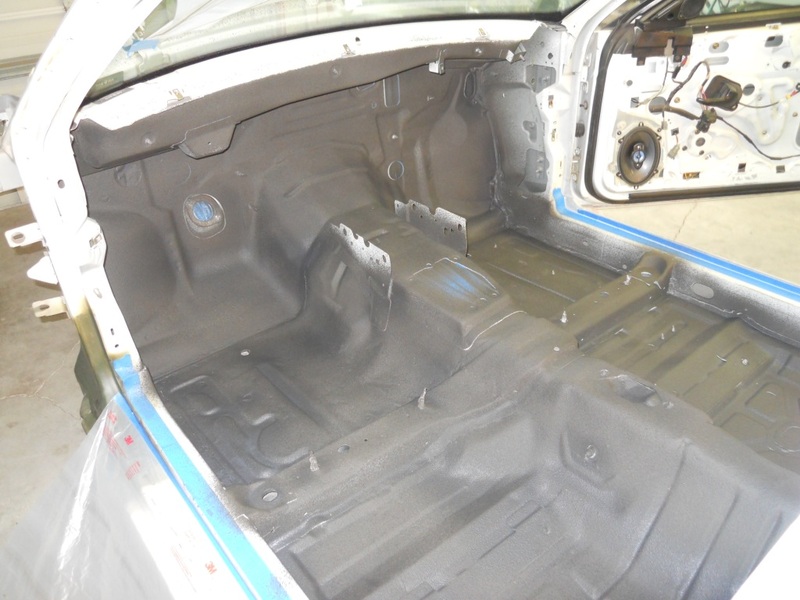 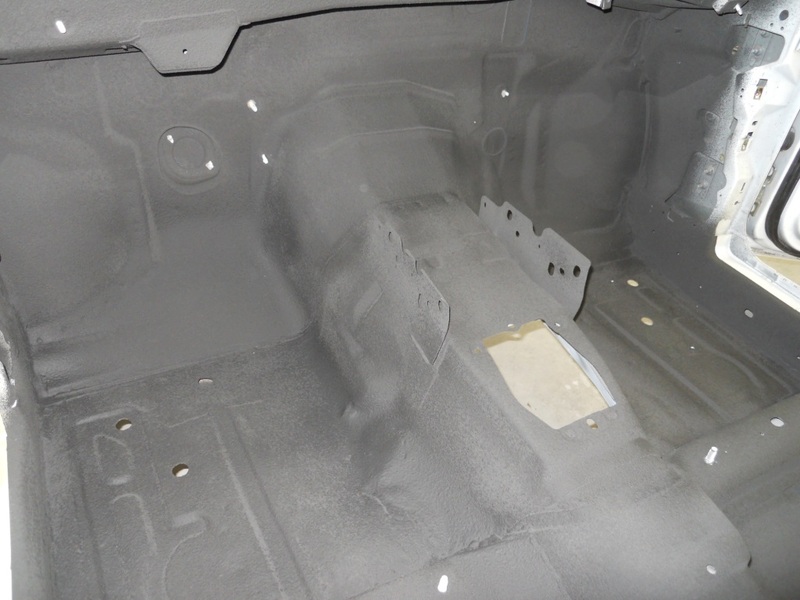 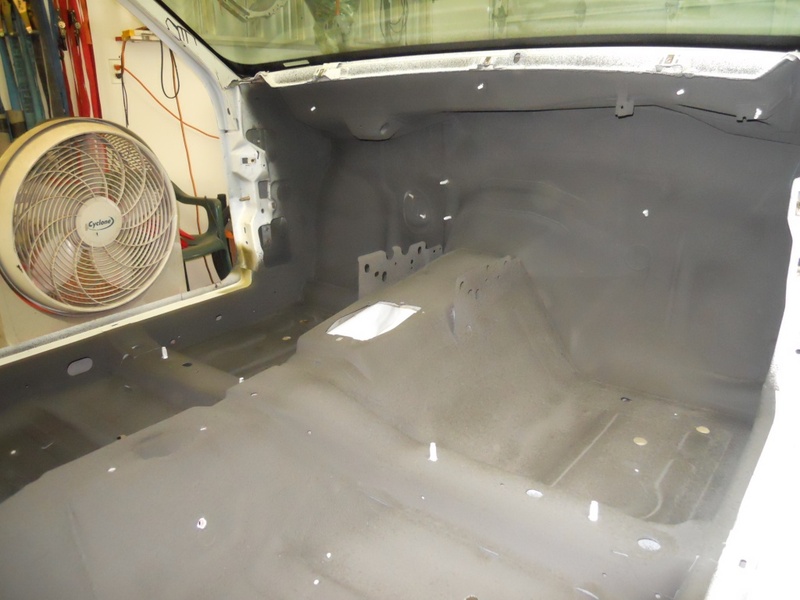 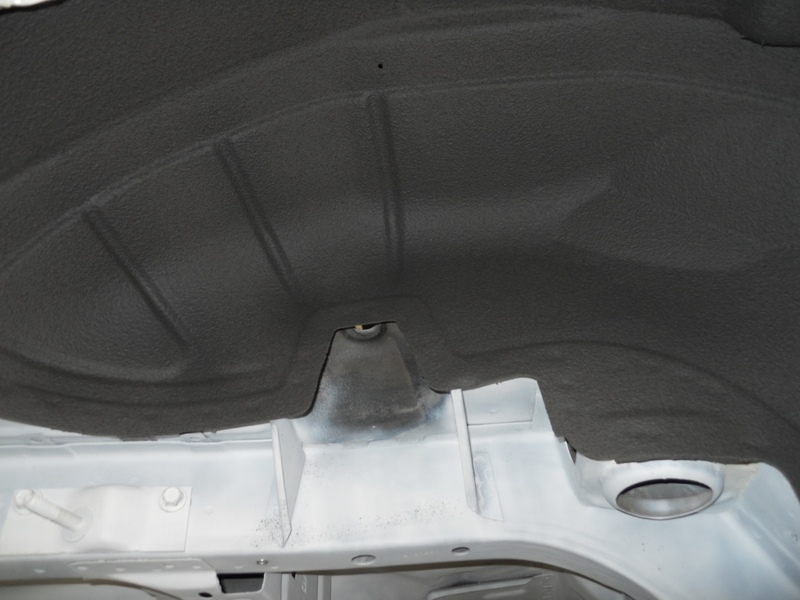 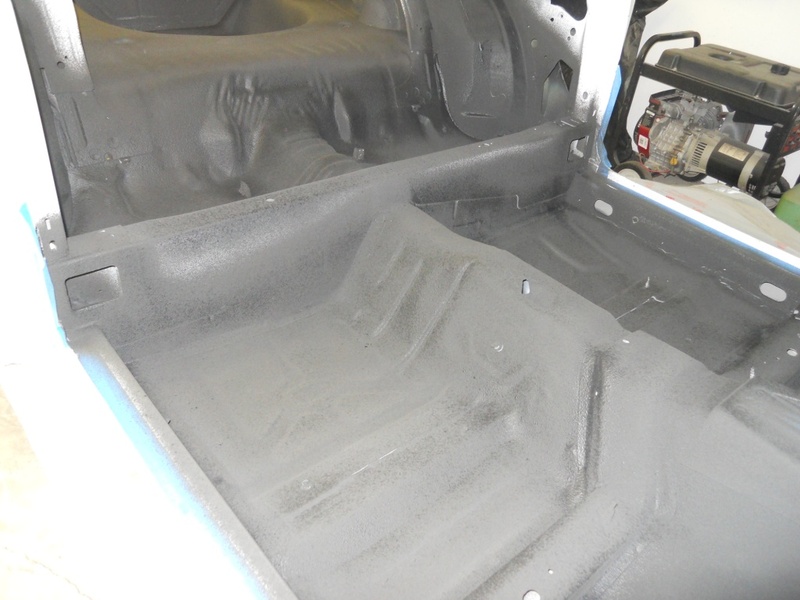 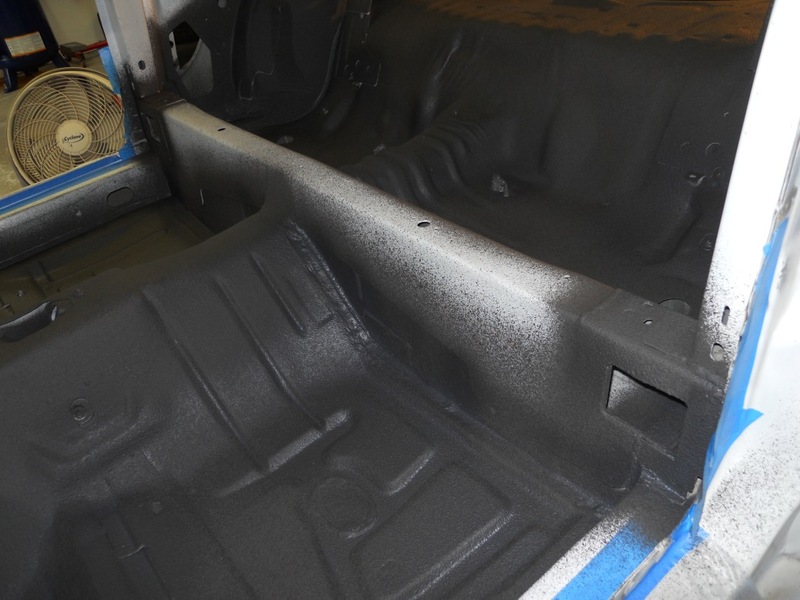 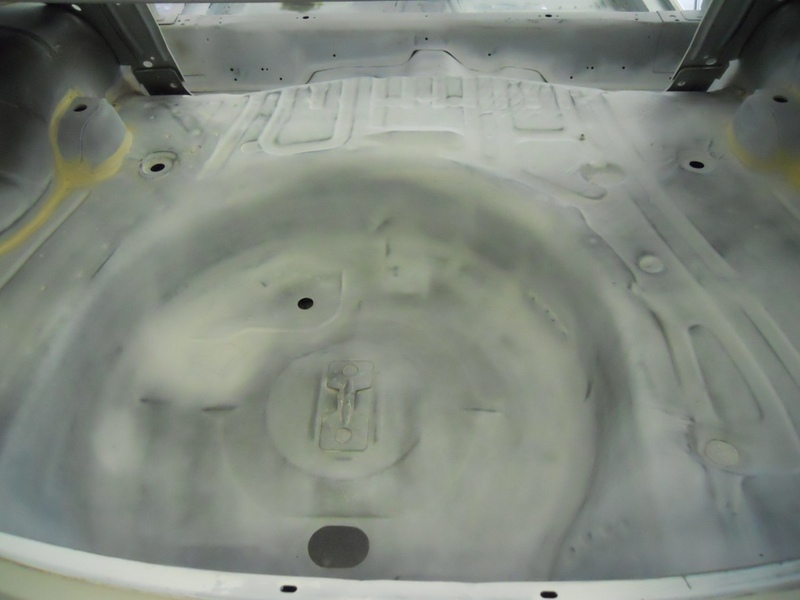 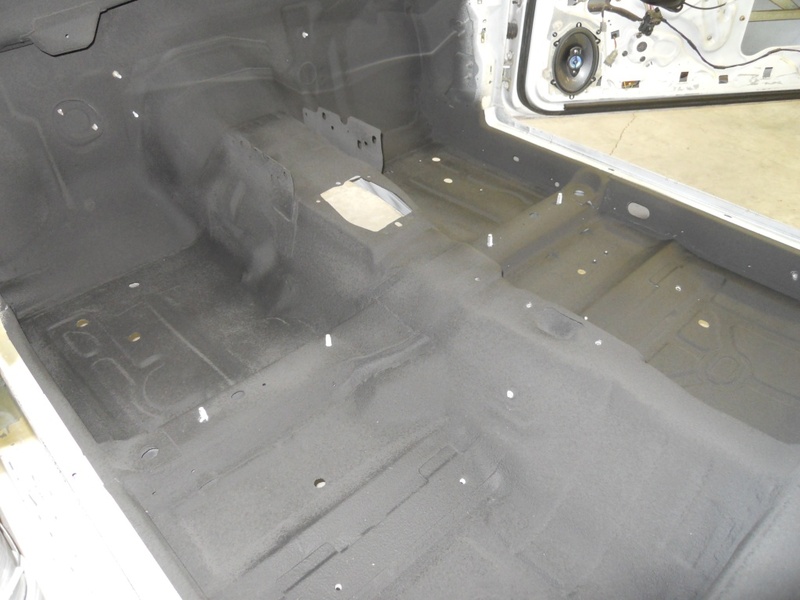 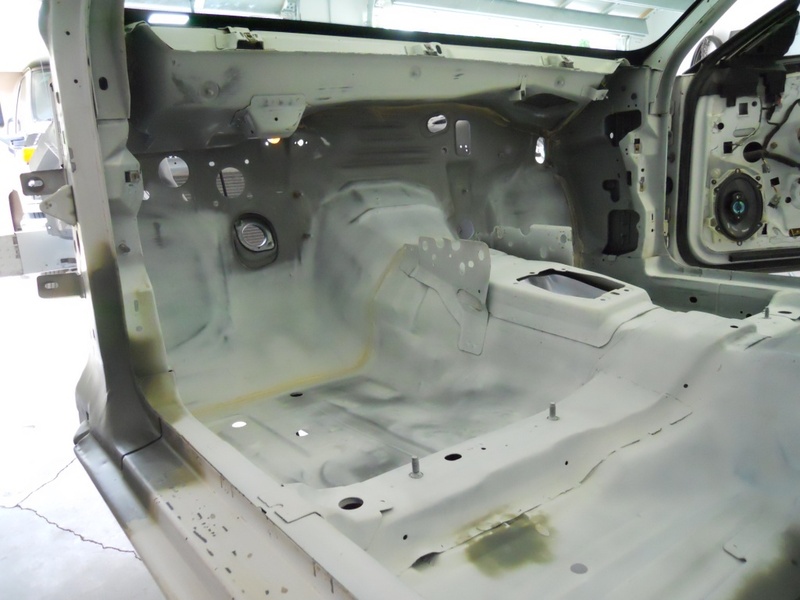 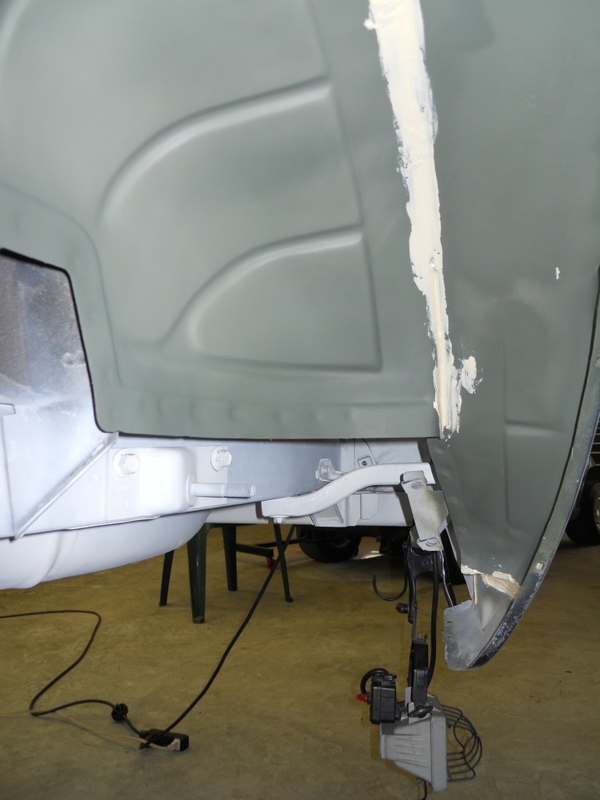 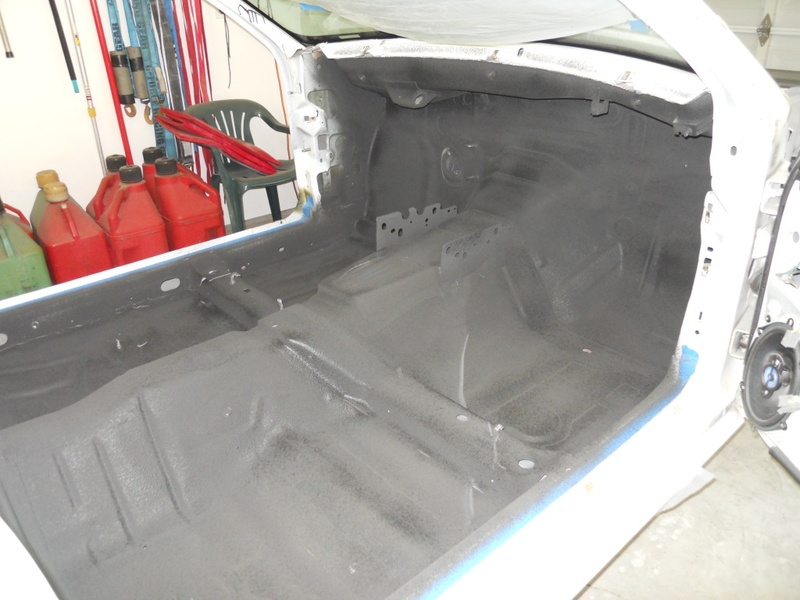 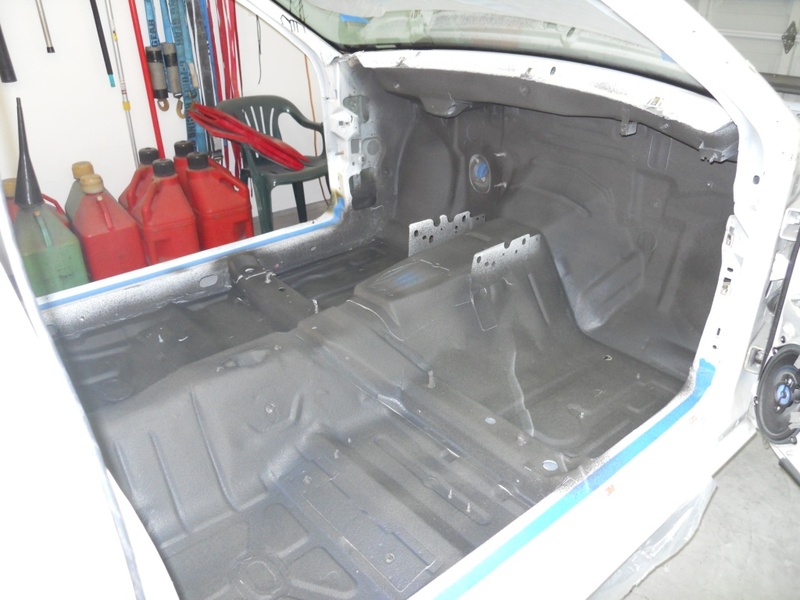 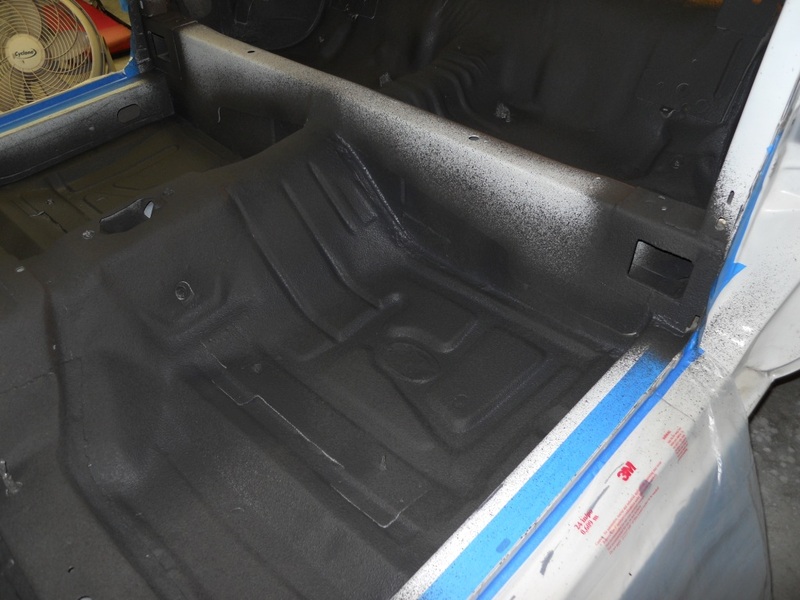 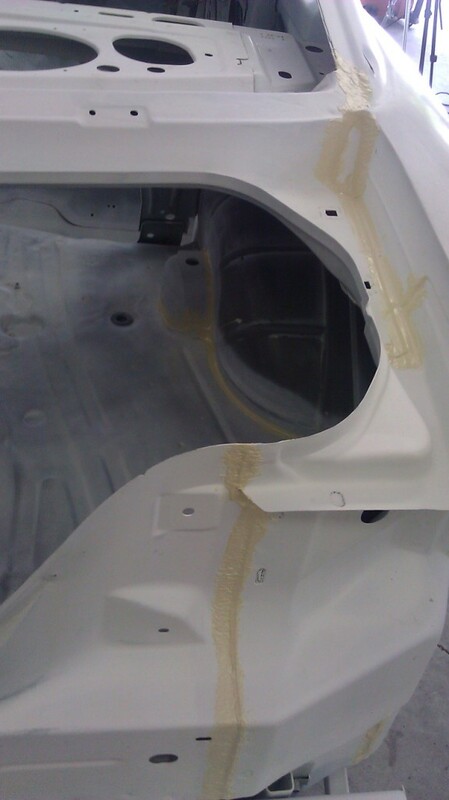 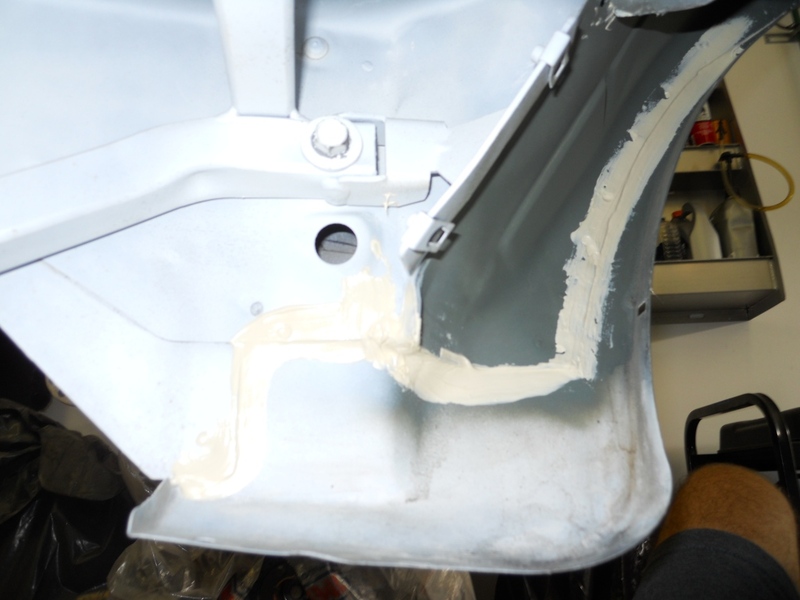 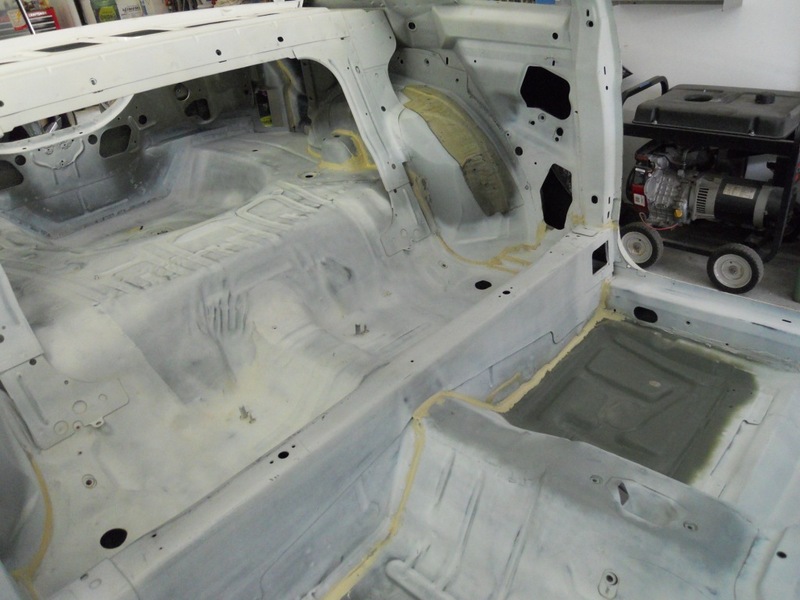 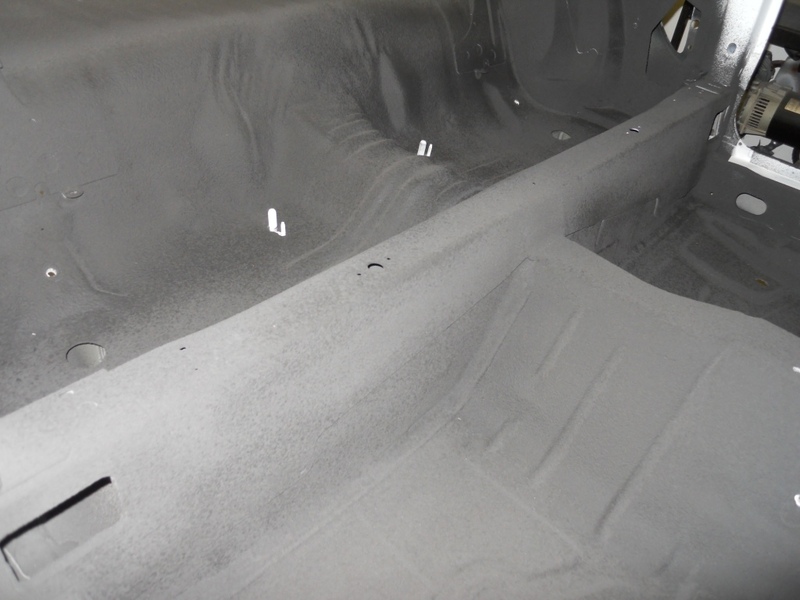 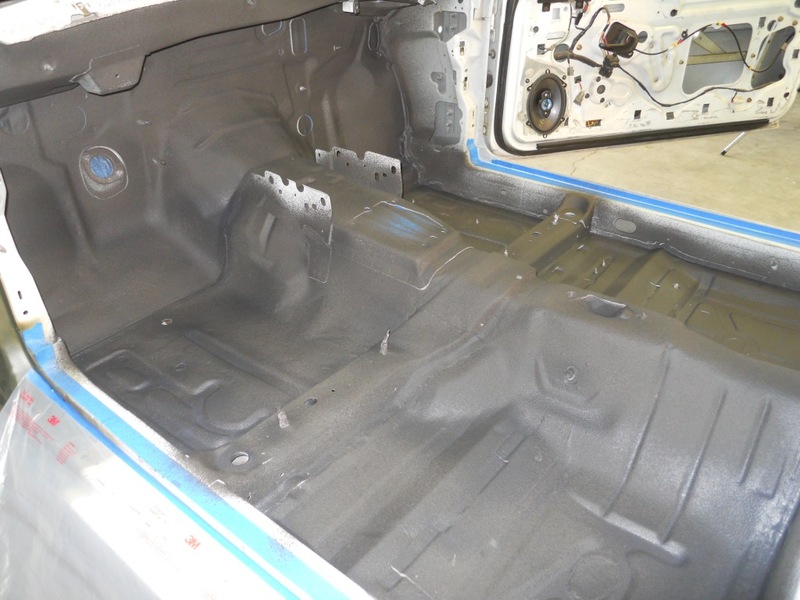 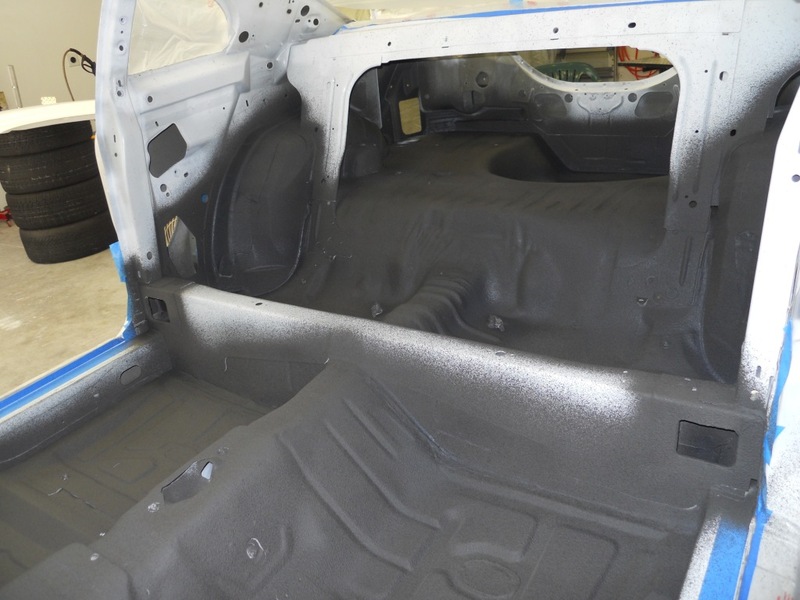 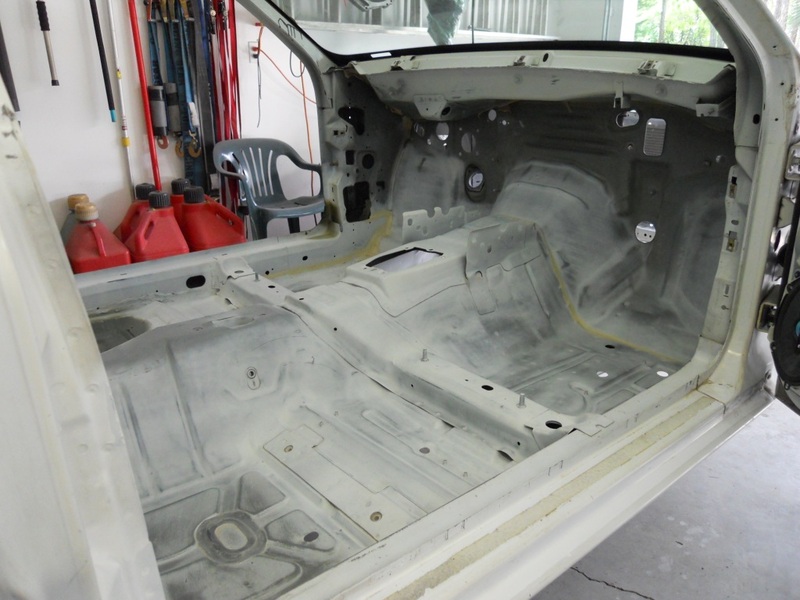 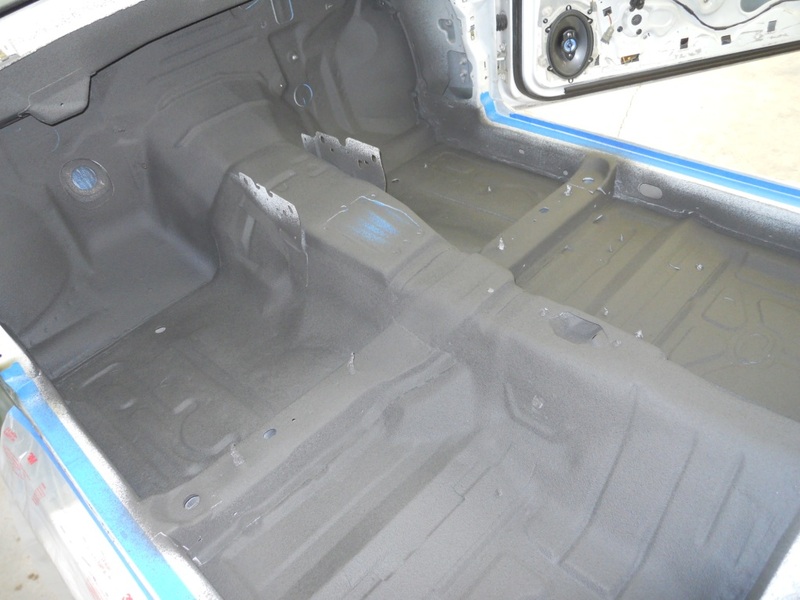 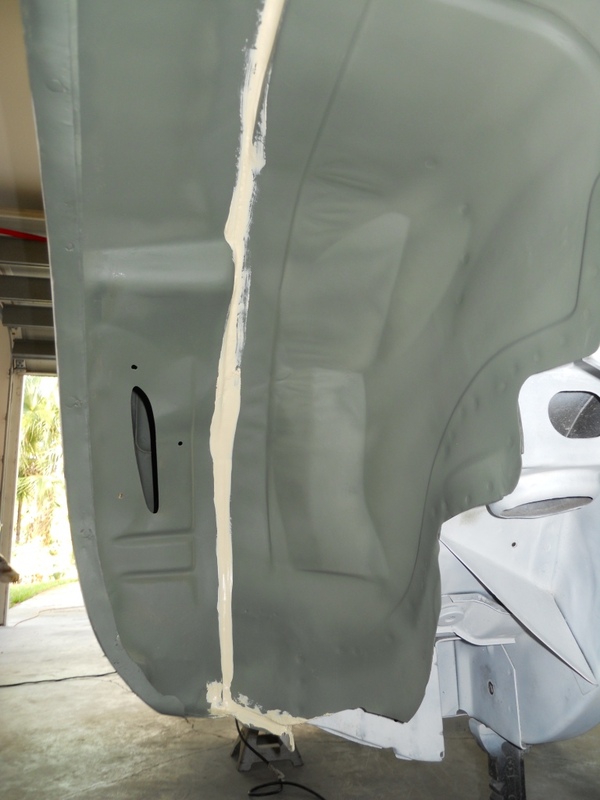 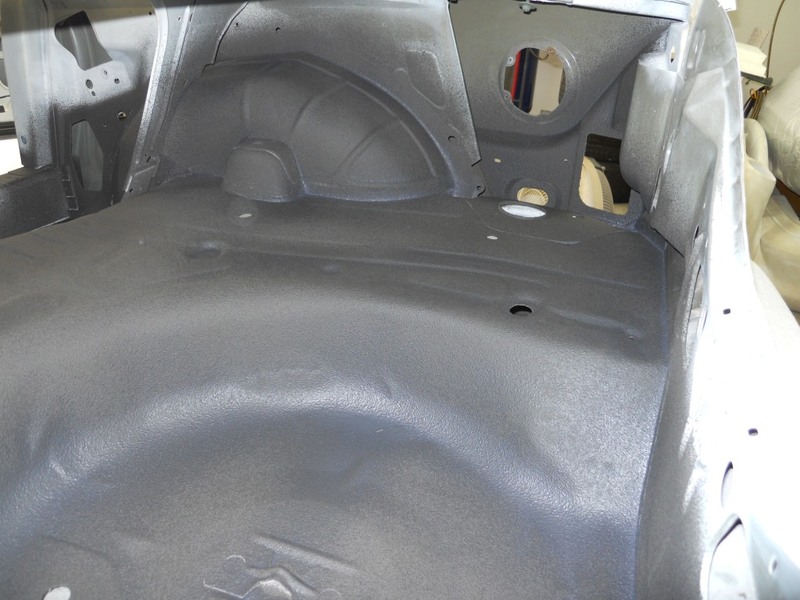 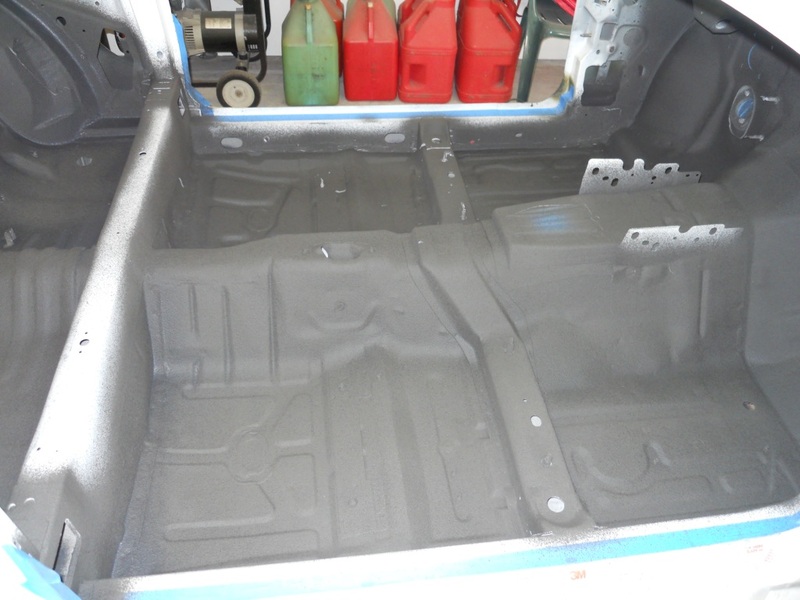 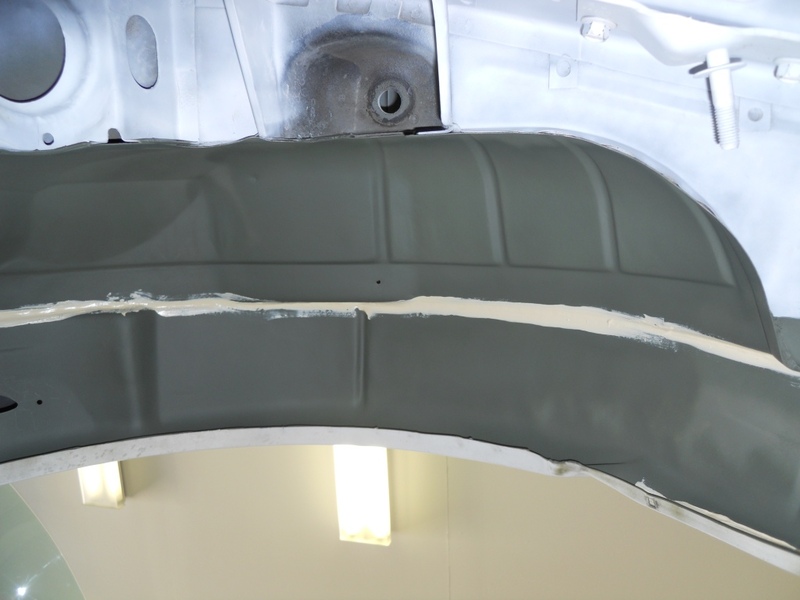 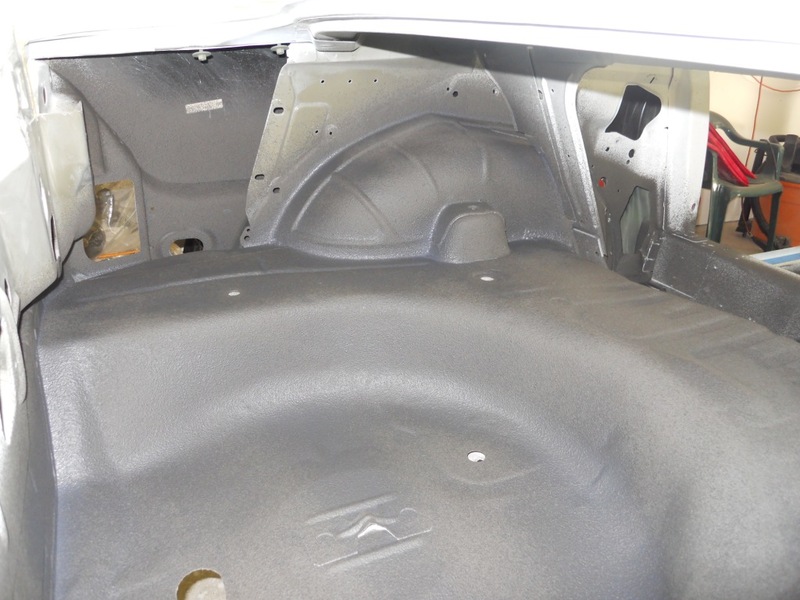 After the seam sealer was cured, the firewall, ceiling, floorboards, wheel wells and trunk floor were all scuffed with a Scotch-Brite pad to promote adhesion. 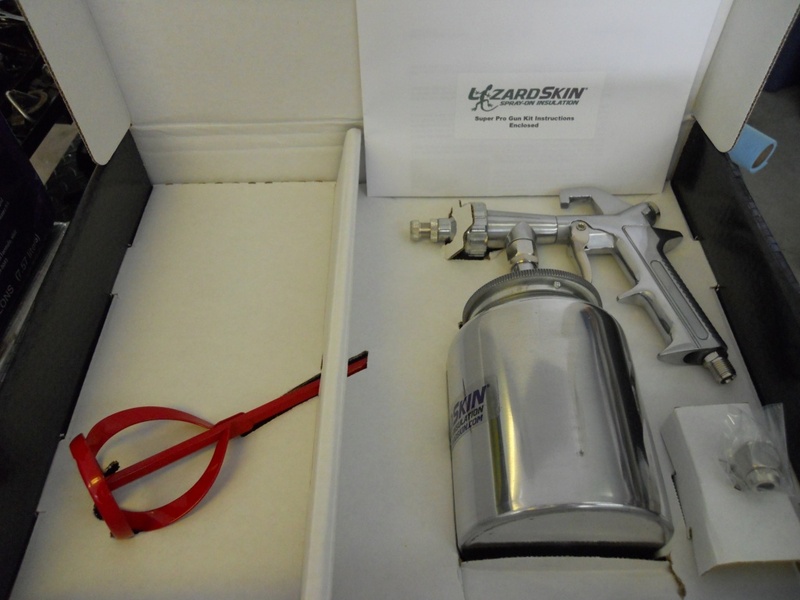 Now the LizardSkin can be applied using their SuperPro Spray Gun Kit. 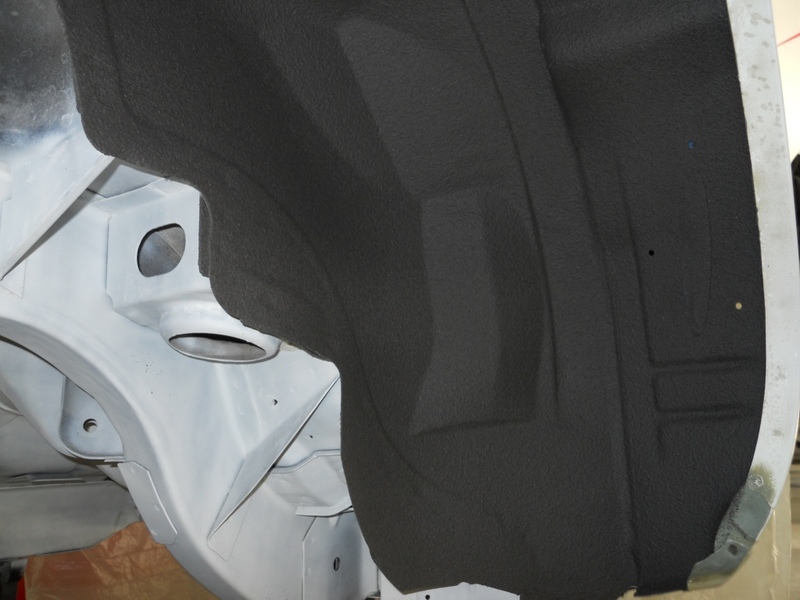 The gun uses a large spray nozzle as the product is very thick. 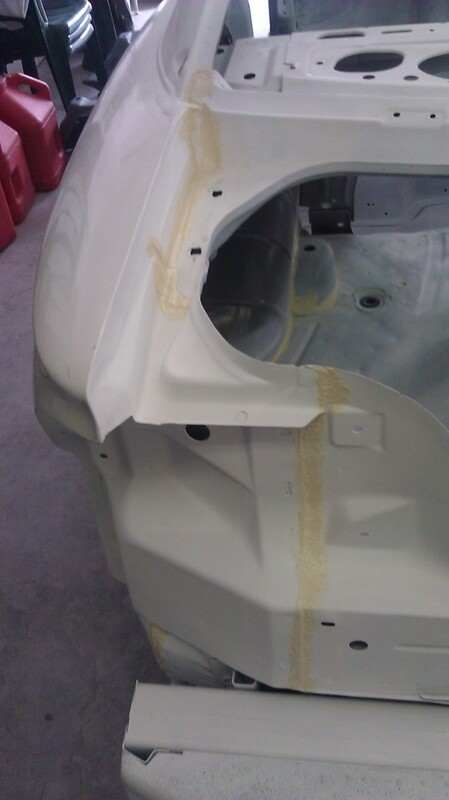 You do not want to try this with a 'regular' spray gun. 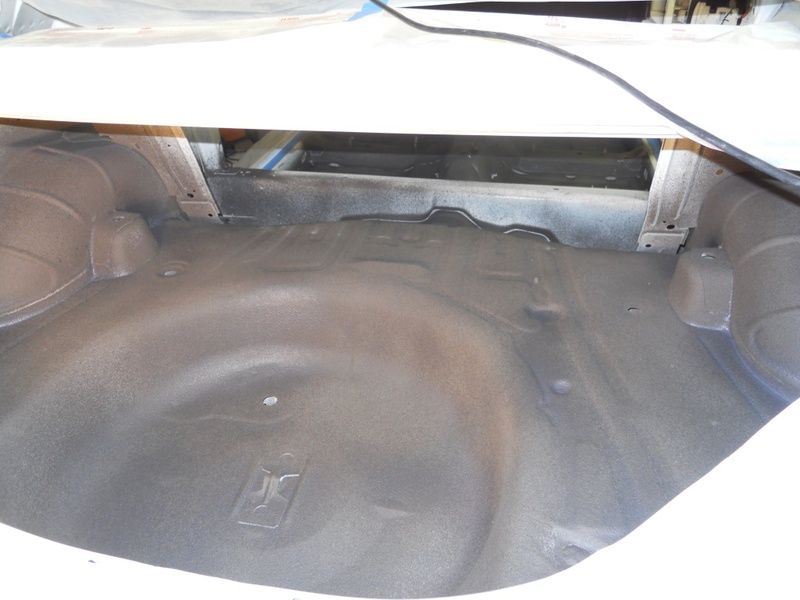 Three coats of the Sound Control (SC) were applied. 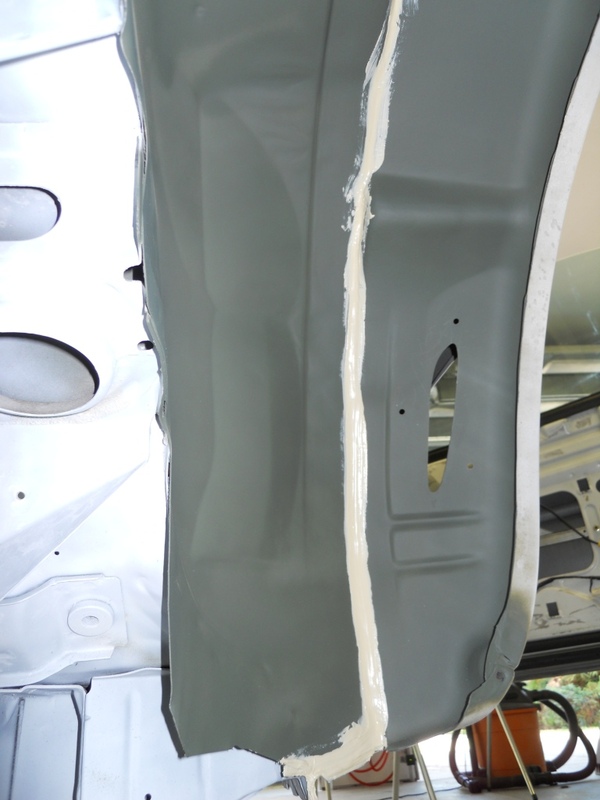 It is very important to apply a very light first coat and let each coat dry before proceeding with the next. 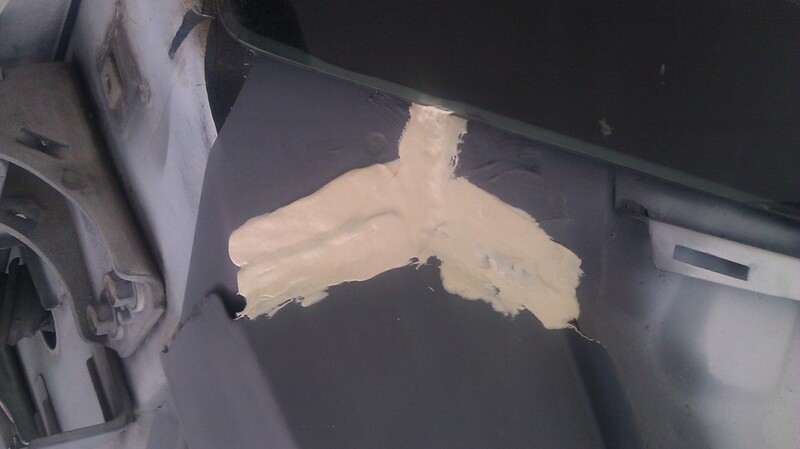 The next day, we continued applying LizardSkin. 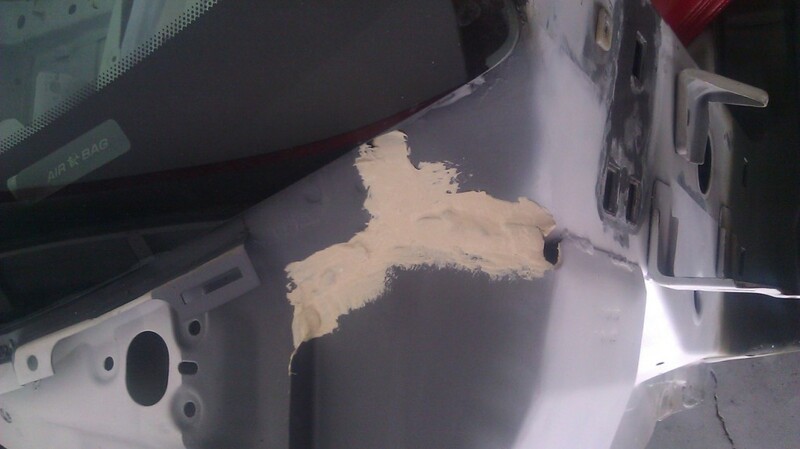 This time it is the Ceramic Insulation. 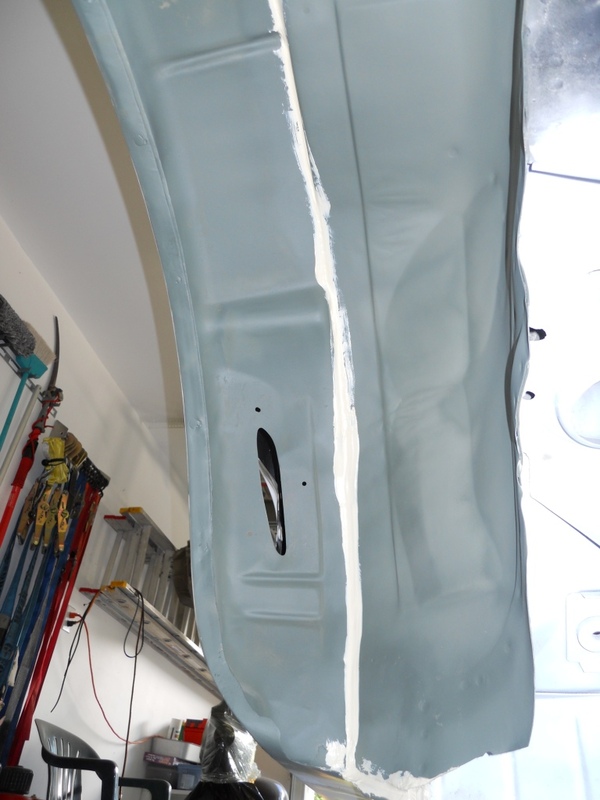 The same spray gun is used, but the air pressure is adjust upwards for the CI product. 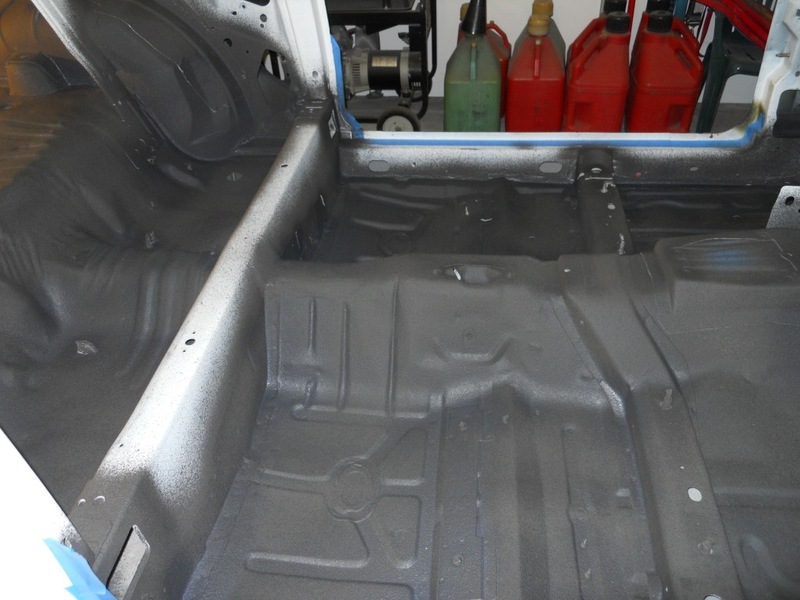 Two coats will be applied.